The Shaolin Monastery in Northern China (Henan Province) was built in circa 495 AD on the imperial decree of the Emperor Xiao Wen Di of the Northern Wei Dynasty. It was, from construction until the end of Imperial China (except for during the Ming Dynasty), the Imperial Temple where Emperors would go to pray for the health and prosperity of the Empire. This continued until 527 AD when another Indian monk, the Venerable Bodhidharma, arrived in China. He was an Indian Prince who renounced his luxurious life to become a Buddhist monk. He was sent to China to spread what became known as Zen or Ch’an Buddhism, a form of Mahayana Buddhism. After arriving in South China and travelling up to the capital, he had an interview with the Emperor Liang Wu Di. Bodhidharma then left the capital and travelled to the Shaolin Monastery where he found the monks so weak that they often fell asleep during meditation. Furthermore, the monks were in poor health. To prepare the monks physically, emotionally and mentally for the rigours of spending a long time in meditation, he taught them two sets of exercises; The Eighteen Lohan Hands and The Classic of Sinew Metamorphosis. These are the forerunners of Shaolin Kung Fu and Shaolin Chi Kung. As the Shaolin Monastery was the Imperial Temple, many of China’s greatest and most influential citizens retired to the Temple to cultivate. This group included top military generals (who were accomplished warriors in their own right), poets, artists and members of the Royal family and other nobility. The result was a concentration of the elite of the Chinese civilisation for a period of over a thousand years retiring to the Shaolin Monastery where they spent the rest of their lives practising spiritual cultivation. Over time, the generals and warriors modified the 18 Lohan hands to become the prototype of Shaolin Kung Fu. It is a common misconception that all Kung Fu originates from Shaolin. What Shaolin Kung Fu represented and still represents is the first time Martial Arts were institutionalised. The result of this was the constant evolution and crystallisation of the Shaolin Arts over a period of 1500 years to what has been passed down to us today. During the Ming Dynasty (1368-1664), a second Shaolin Monastery was constructed in the south of China (Fukien Province) because the Ming Dynasty capital city was in the south (Nanjing) as opposed to the northern capital of Peking. The Ming Emperor wanted the Imperial Temple to be in the south as well as in the north. The construction was again my Imperial Decree. The dynasty which succeeded the Ming was the Chinq Dynasty (1644-1911). The Ching were considered foreigners by the indigenous Han Chinese as they were invaders from Manchuria in the north. At first they occupied the north of China, only later conquering the south. At this point, Shaolin Kung Fu and Shaolin Chi Kung were no longer practised in the Northern Temple but continued to flourish in the Southern Temple. Eventually the rest of China was brought under the rule of the Ching. The southern Shaolin Temple was still flourishing but was increasingly becoming the centre of revolutionary activity. Many of the secular disciples were part of organisations determined to see the overthrow of the Ching Dynasty and the restoration of the Ming Dynasty. The result was that the Ching Emperor infiltrated the southern Temple. Once he had learnt their secrets, he set upon the temple with the assistance of Imperial Guards and mercenary Lama fighting monks from Tibet. The temple was burned to the ground. Many monks were killed, but a number of them, as well as several secular disciples, escaped the fire. One of the senior monks who escaped was the Venerable Jiang Nan. With the Ching army in pursuit, he fled overland to the border of Malaysia and Thailand. For fifty years he only had one mission – to pass on the traditional Shaolin Arts to a deserving disciple. At the age of 80, the Venerable Jiang Nan encountered a travelling medicine man that used a Kung Fu demonstration to attract people to buy his goods. This man was called Yang Fatt Khuen. He was an accomplished martial artist who regularly had to use his skills to fight off the Siamese Boxers who came to cause trouble or pick fights. After watching the young man’s demonstration, the Venerable Jiang Nan (who looked like any other old man) approached Yang Fatt Khuen and told him that his Kung Fu was what past masters referred to as “Flowery Fists and Embroidery Kicks”. Yang Fatt Khuen was offended and angry, but the old man told him not to take his word for it – a friendly sparring match would prove it instead. Yang Fatt Khuen was amazed that this 80 year old man could not only spar with him, a young man in his twenties, but he could handle him like a child. Yang Fatt Khuen immediately apologised and begged the old man to accept him as a student. After accepting him, the Venerable Jiang Nan passed on the Shaolin Arts to Yang Fatt Khuen and later chose him as his successor. Years later, when Yang Fatt Khuen was in his sixties, he accepted a young man by the name of Ho Fatt Nam as his student. Ho Fatt Nam was already a master of seven styles of Martial Arts and was a professional Siamese Boxer. He originally wanted to learn the Shaolin Arts to improve his Siamese Boxing, but after training for a short while, he gave up everything else to concentrate on the Shaolin Arts because he recognised the tremendous depth and scope of these arts. When he retired, Yang Fatt Khuen appointed Ho Fatt Nam as his successor. Like his master and his master’s master before him, Ho Fatt Nam selected, trained and passed the Shaolin Arts on to a disciple. This disciple was named Wong Kiew Kit. Before meeting Ho Fatt Nam, Wong Kiew Kit had already trained Shaolin Arts under his first master, Lai Chin Wah. Lai Chin Wah’s lineage came from the second southern Shaolin Temple. This temple was built by the Venerable Chee Seen, another of the monks who escaped the burning of the first southern Shaolin Temple. 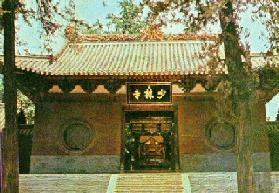 The Venerable Chee Seen chose to construct another, smaller Temple at the Nine Lotus Mountains in Fukien province. The famous Chinese martial arts that have descended from the “5 Ancestors” (Hung, Mok, Choy, Liu and Li) are of this lineage. This temple was used to train revolutionaries as well as to pass on the Shaolin Arts, but due to the immediacy of the issue, the training was designed to be swift and primarily for combat. This is the reason that many Shaolin lineages that descend from the second southern Shaolin Temple are relatively “hard” and “external”, as opposed to the Shaolin Arts passed on by the Venerable Jiang Nan, which were comparatively “soft” and “internal”. This difference can be attributed to the different aims and objectives of the separate lineages; one was to train revolutionaries in a comparatively short space of time; the other was more spiritual and holistic – the Venerable Jiang Nan was a missionary, not a revolutionary. The Shaolin Wahnam Institute was created to pass on these Shaolin Arts in the hope that they will remain preserved for future generations.